Just as the African story was beginning to sound interesting again, now that we were learning to forget the violence in Central African Republic and South Sudan, along comes Ebola and it spoils the party. 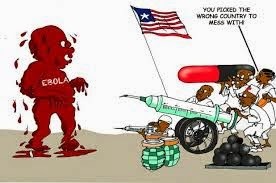 The malady is close to killing 1,000 people in West Africa in the nations of Liberia, Sierra Leone, Guinea and now Nigeria since the first outbreak in March. Suspected infected folks who’ve passed through Africa or were doctors working to help fight the disease, are beginning to pop up here and there in other parts of the world. to initially occur after an Ebola virus is transmitted to humans by contact with infected animal fluids. Human-to-human transmission can occur via direct contact with blood or bodily fluids from an infected person. So, to put it crudely, it’s the hunting, slaughter, and eating of meat from wild animals — including birds and bats — that is mostly to blame for Ebola. Now scientists are saying that if, especially Africans, don’t curb the eating of bush meat, not only could Ebola epidemics get worse in future, but other viruses lying in wait could be unleashed because 75 per cent of new infectious diseases affecting humans are diseases of animal origin. For that reason organisations like the UN’s Food and Agricultural Organisation say that population growth that leads to human encroachment of forests and wildlife reserves, among other factors, will provoke massive killing of wild animals for subsistence or commercial purposes… and strange ailments are likely to emerge from the forests. Scary stuff. Colleagues at Mail & Guardian Africa landed on data from the Centre for International Forestry Research and the Secretariat of the Convention on Biological Diversity estimating that more than a million tonnes of bush meat are harvested from Central Africa alone each year! That is one billion kilogrammes of bush meat in one region alone. It depends on how you count it, but if you take the smallest animal as a bird weighing one kilogramme and the larger ones as a big monkey (they eat those in Central Africa) coming in at 50kg, and take the average weight of an animal killed for bush meat to be 20kg, that means our brothers and sisters there are downing 500 million wild animals a year! If some human-eating species, and not we inhabited the Earth, at that rate they would eat half the population of Africa in a year. In July I was in Rwanda and attended the mountain gorilla naming ceremony Kwita Izina. There was a humorous bloke from Nigeria there, who said there are no mountain gorillas in West Africa because they “ate them all long ago”. These are serious matters, but in Africa if sometimes you don’t take a light-hearted view of our problems, you will run mad. I was chatting with a Kenyan editor when the Ebola story was beginning to gather momentum, and he wondered why Uganda, the Democratic Republic of Congo and South Sudan, have had Ebola but not Kenya considering that it is one of the main transit points in Africa. Like all true journalists, because I didn’t know, I speculated. I suggested to him that it is because Kenyans have cut down or grabbed their forests, and there is little cover for Ebola-carrying animals to hide. I also offered that Somalia is not a good environment for Ebola, as they have cut down everything green for charcoal. Perhaps those loony climate change deniers in America should come to Africa, for here they might find the best argument for climate change; it reduces the transmission of deadly diseases from forest wild beasts to humans. More seriously, and importantly, the Ebola attack demonstrates what is our existential challenge. Those American missionaries who were infected by Ebola were flown home, and they were treated with an experimental drug that seemed to have worked. There are about five such medicines — and vaccine — being developed in the US, although it faces virtually no risk of home-grown Ebola. However, there is none in Africa, and we have been reduced to criticising the Americans for not doing enough to share their Ebola medicine. We can build roads, railways, skyscrapers, oil pipelines, name it. But until we do smart science and invest in knowledge and research, we shall still be rich sometime during this century, yes, but we shall never rule it.